An incomplete unidentified object, very similar to BH-CA39C0. It comprises an incomplete copper-alloy ring, circular in cross-section (c.3mm diameter) and with a double moulded collar to one side from which extends a circular-section spigot, apparently tapering to a point. It measures 15.77mm in length, 15.27mm in max.width and 6.57mm in max.thickness (at the collar). It weighs 2.42g. 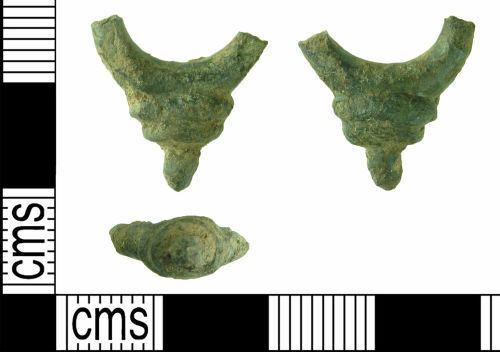 Of BH-CA39C0 the authors write 'The form of this piece suggests it was probably a swivelling handle attachment, probably from a Roman metal vessel'.